All of our systems are custom made, cost effective, environmentally friendly and are made right here in the USA. Change Your Water...Improve Your Life! 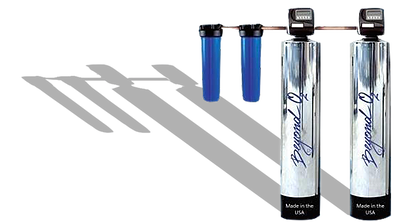 Beyond O2 proprietary water filtration systems start with our industry leading 10 micron sediment pre-filter, which prevents particulate and sediment from entering the tank and interfering with this unique filtration process. Our Alkaline system cleans impurities ranging from pharmaceuticals, fluorides, aluminum, sand, dirt, rust from the water pipes, insects, asbestos fiber, E coli, unpleasant orders of chlorine that are used as a disinfectant and heavy chlorine by-products such as chloramines, THM, and TCE; and finally, through the RO chamber, a wide spectrum of impurities including various kinds of harmful chemical substances such as bacteria, virus, cancerous heavy metals, phenols, pesticides, synthetic detergents, pipe waste, industrial waste, radioactive contaminated materials down to 0.0001 micron (25,400 microns = 1 inch).